Purchasing original artwork feeds my spirit. For me, it is an act of self-love. Seeing it displayed in my home is a reminder of who I am and collecting it is highly personal. I am drawn to pieces that are a reflection of the artist's world view, yet also reflect my own. It's a magical feeling to discover someone whose work speaks so directly and personally to me. Adding to my collection when I am able, fuels my creativity and inspires me to continue to create authentic and genuine artwork that will perhaps speak to someone else. 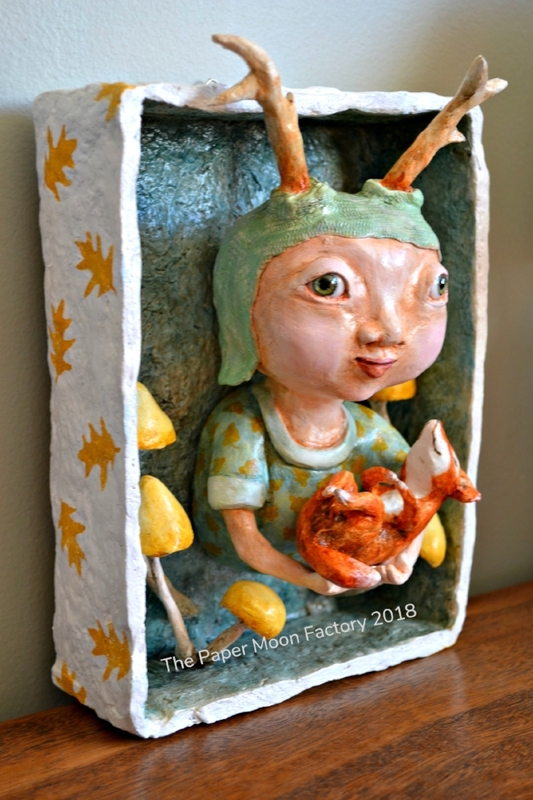 Meet Wood Nymph and The Fox by The Paper Moon Factory. 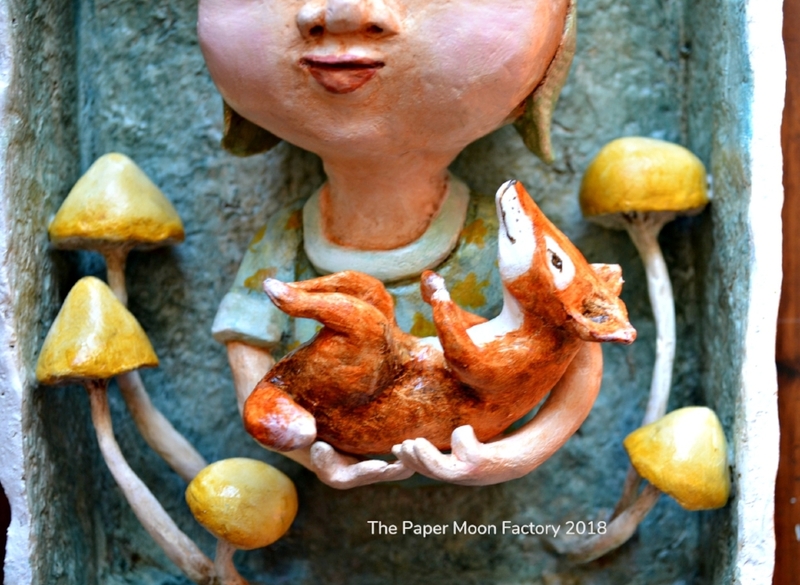 Look at her sweet expression and the tender way she holds Mr. Fox. See how happy he is to be cuddled in her arms surrounded by such beautiful color and details. She loves the trees, plants, the animals and all little insects and cherishes them like here own children. She loves the rain and the wind, she enjoys the little mushrooms between the fallen leaves in fall. She takes care of the little birds nest with precious little eggs in it. The forest is her palace, the clouds are her ever changing ceiling. The little water drops glistening in the sun are her jewels. She is the Wood Nymph. In this piece, those who know me well will reconginze my appreciation for whimsy and my awe of the inexplicable mysteries of our Natural World. It would not surprise me in the least to come across this precious nymph in my walk through the woods one day. Thank you Marion for creating such a beautiful celebration of the gentleness and wonder of Nature. So often we deny ourselves the things that lift us up. Others’ needs and wants come first. We frequently talk ourselves out of purchasing or experiencing things which brings us great joy. While few of us can purchase whatever we want, whenever we want, we can make a deal with ourselves to occasionally invest in those things that feed our senses and affirm our spirits. When something really speaks to your soul, invest in it. Be it artwork, flowers, music, food, wine, books or a day off for a walk in the woods - treat yourself when you can. Trust me, this simple act is life changing.